Once you've backed up your system, how do you restore it? Just attach the medium you've backed up with (external hard drive, DVD/CDs, etc.) and hope that it launches? I recently tried my first and unsuccessful backup (I didn't have enough DVDs). But the files that were backed up seemed encrypted. This is actually a very common question - and a very important one. Depending on how you're backing up, and what you're backing up, there may be some key steps you'll want to take prior to needing those backups so as to be able to use them when the time comes. While the specifics vary dramatically from situation to situation, the concepts do not. I'll cover those concepts and point you to the things you need to know before disaster strikes. I'll start by splitting backups into two broad category: file and image. "... all of this is moot if you're not actually backing up." For example: let's say you mistakenly delete, overwrite or somehow trash the file containing your bookkeeping records. 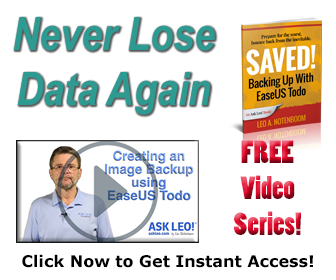 You can recover that file from a file-based backup. The biggest issue with recovering from a file-based backup is getting it out of whatever storage method your backup program uses. This is where we can't really dive into specifics, since each program might use its own. Some programs simply copy files - literally. Restoring the file is nothing more than locating the backup copy of the file on some storage medium, such as the external hard disk it was backed up to, and copying it back. But that's all it really boils down to for restoring files from a file-based backup: locate the backup and use the original backup programs browse functionality to locate and extract the files you're looking for. An image can be restored to a secondary hard disk on a working system. That means you can't restore it to the hard disk that's in use by the system (typically C:), but you can restore it to some other hard disk installed on the machine. In this case, you typically just run the backup software and use a restore function that it should provide. An image can be restored to the primary hard disk on any system by booting from some other media. In other words, in order to perform a complete restoration of your primary hard drive (again, typically C:), you have to boot from something else. Most image backup programs also include the ability to create a bootable restore disk for just this purpose. It's that last scenario that is both the most powerful, and the most confusing. And the thing that most people don't prepare for. Preparation is actually fairly simple. Before you ever need your backup - ideally when you set up your periodic backups in the first place - make sure you have or create the restore boot disk that your backup program should provide. Save it in a safe place so that if you ever need to perform a restore, you'll have it ready. Note that this is not the same as the disk containing your actual backup. That disk is rarely bootable by itself. The bootable media is a separate disk - often just a single CD - that you have or create once and keep somewhere safe. Boot your machine from the bootable restoration media. Attach or locate your backed up data - perhaps by attaching the external hard drive you'd been backing up to. Run the backup program which was on the bootable media and use its restore function to restore data from your backup drive to the hard disk in the machine. Again, conceptually simple, but it's very easy to overlook that initial step. What's unique about restoring an image backup is that you don't need to have anything installed on the machine's hard drive; it can be a brand new and completely empty hard drive. You boot from a CD, and then restore a backup image to that new hard drive. Sometimes even with an image-based backup you just want to restore a file. The good news here is that almost all image-based backup programs will also let you view the contents of an image backup and extract from it just the file or files you need. In many ways this is just like a file-based backup. Just fire up the backup program and use its restore or browse features to examine the contents of one of your backups to locate and restore your file. An image-based backup can be considered a superset of a file-based backup; it has everything that the file-based backup has, and more. The cost? The size of the resulting backup, and perhaps the amount of time it takes to perform either the backup or restore. No article on backing up would be complete without reminding you that all of this is moot if you're not actually backing up. Back up regularly, so that when the time comes you'll have some of the options above to choose from as you successfully restore your data. If I get this particular backup device, can I then use it to restore my entire system? Having a device on which to backup data is only half the battle. If you want it to be able to restore your entire machine, additional steps are needed. I repartitioned my disk to one partition moved all of my user files to My Documents and made a little batch file to back My Documents and a few files such as Firefox shortcuts and Thunderbird files to my removable drive. This works for me. I've never had a crash but I've restored from this backup successfully a few times after installing a new os. I'm considering signing up to Carbonite. It seems exceptionally reasonably priced. In act my hesitation is that it seems too good to be true at that price. Does anybody out there know if it's really as good as they say or at least doesn't have any hidden problems? Since I have created simple backup methods for small businesses, this is my favorite topic. Most backup programs, problem 1: You don't know if the backup worked unless you restore. Who has the time and dedication for that? Problem #2: most commercial backups create one or more gigantic files and it's impossible to restore one file--it's all or nothing. Solution: buy an external drive, USB or ESATA, and simply copy your files to that. You can even use simple DOS commands which keeps files and folders intact. Many copy programs will even be bootable, so you can boot to the backup! Image and ghosting methods used to make sense when hard drives had small capacity and were expensive. No reason to use them anymore. I was "lucky" enough to buy from Norton.com their backup. When I lost my info they were hopeless,the workers (4) on their online chat support knew nothing.They want me to call them free on 1-800 but I don't live in the U.S.A. and I told them 6 times it won't connect. So I lost and am peeved. This article discusses: Is an online backup service a good idea? In response to Mark Jacobs 24th May, I have been using carbonite for a few years and find it an excellent backup system, I have it installed on 2 computers and the unlimited storage cappacity is excellant value. On one computer we have over 24G of photographs stored on Carbonite which is an excellent secure off site storage for these irreplaceble files. However it will only back up your files on your computer for more than one computer you need an additional subscription. Please NOTE: It does not do an image backup, in addition it doesn't backup any external hard drives so if you wish to back up these file you will need another backup program. I have used the windows 7 'Restore Previous Version' function on quite a few occassion of late and find this an extremely effective way of restoring individual files or folders, cheers from downunder, the land of oz. Great article. I find it best to use a combination of Image and incremental backup. As Leo pointed out an Image takes a lot of time and space, so it is not something you want or need to do often. If my computer crashed today, I would restore the Image I have which is 3 months old. Now my computer is restored to 3 months ago. I take the My Documents folder that is in my incremental that I run weekly and drag that to my restored computer. Now my computer is up to date. The only thing that I would have to load would be any applications I have installed since my last Image. Your answers are in depth. But, when I need speedy answers I don't like to look in your comments cos they are lengthy. 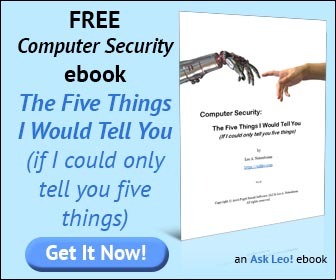 I suggest you create a pane for summary (quick answers).